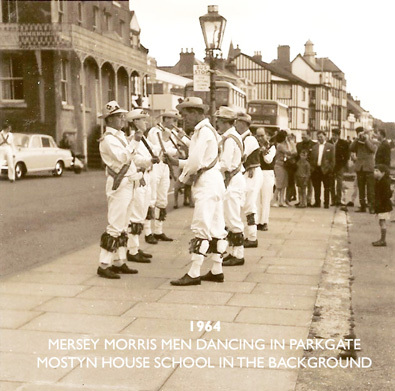 Although the Mersey Morris Men were only formed in 1960 (by merger of the Liverpool and Wirral sides), the history of the original teams has been traced back to the 1930’s in some detail. Before this, evidence and references have been much harder to trace. However, various men have been busy and believe that confirmatory evidence will be unearthed for the following highlights of Morris history on Merseyside. When the first Mersey road tunnel was opened by George V on 18th July 1934, the Wirral and Liverpool Men both danced in procession through the tunnel from their respective ends and then danced together under the Mersey. When the Victorian Overhead Railway (now long gone) was first opened in Liverpool in 1888 by Her Majesty, the Morris Men were there – and Victoria was amused. The Liverpool Men were such a familiar site on the streets of the old city, that when the Liver Building was constructed in 1908, their mascot – the Liver Bird – was adopted by the City and statues cast to go on top of the building. Not to be outdone, the Higson’s Brewery, also approached the Men for permission to use their emblem, and of course this has continued over the years, to the extent that it is associated with the City of Liverpool and even their football team by some who have never even seen the local Morris side. The Wirral Men danced on the deck of the Ark Royal in Cammel Laird’s yard, immediately prior to her launch in 1938. Unfortunately, the detail in the popular photographs taken from the Liverpool side of the river is not quite good enough to allow positive identification of the individual dancers involved. Both sides danced together in an early combined event at the opening of the Cain’s Brewery in Liverpool. It is not just because of the quality of the beer that the Mersey Men so often frequent Cain’s pubs to this day. Back to Liverpool and in one of the common moves of venue for practice and occasional public performance, the Liverpool Men moved out of a small back street cellar to more salubrious surroundings. A local pop group then moved in, named themselves after one of our dance steps, and have often thanked us for giving them their start – and many of our audience – at the Cavern Club. From July 31 to August 13 in 1929, Arrowe Park was the venue of the International Scouting Jamboree, and Lord Baden Powell sent several of his scouts to collect suitable sticks from the woods to supplement those broken by the vigourous clashing of the WirralMen. The Liverpool men not only danced on the platform when the first steam train ran fromEdge Hill to Manchester, they actually rode on the train and were met by the Manchester Men with whom they danced, both then and on several subsequent occasions. Cognoscenti of the Morris will no doubt be interested to know that Mersey attended an instructional weekend for the Headington Quarry Morris Men in 1901. Eager to practice what they had learnt, the Headington side danced out on the following Boxing Day. There they were seen by a previously unknown Folk revival collector – and the rest, as they say, is history. Some of our researchers are convinced that they will eventually trace our roots back to the group of dancers who performed to appease Thor, shortly after he hurled the stone at the Wirral which gave Thurstaston its name. Despite the fact that the Mersey Men still dance on this site at sunrise on May first every year, we have to admit that even some of the men find this rather an extreme stretch of the imagination. We hope this fabulous history has given you some enjoyment and an insight into the local Morris tradition. 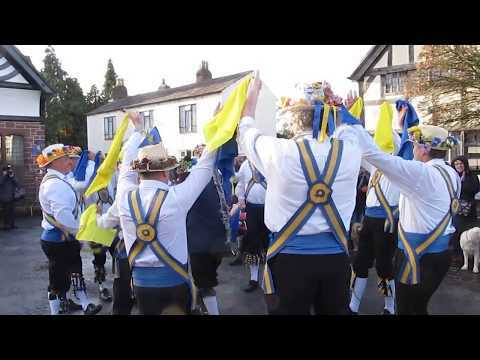 We hope you will also enjoy our dancing and contribute generously to keeping the traditions of the Morris alive whenever and wherever you see us perform.